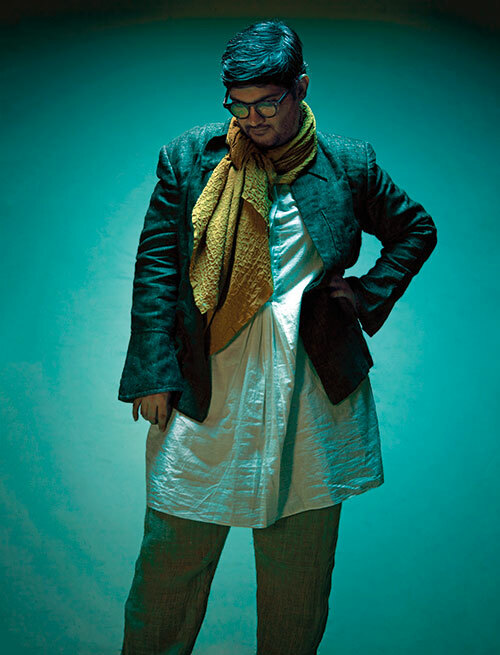 Indigo-dyed kurta, oversized and double-breasted jacket, both from 11.11 / eleven eleven, New Delhi. Block-printed scarf, glasses (worn throughout), all Abhinit’s own. With the advent and proliferation of social media, the world of visual and fine arts is at a crossroads. Various questions about the role, curation and experience of art lead to its constant redefinition. 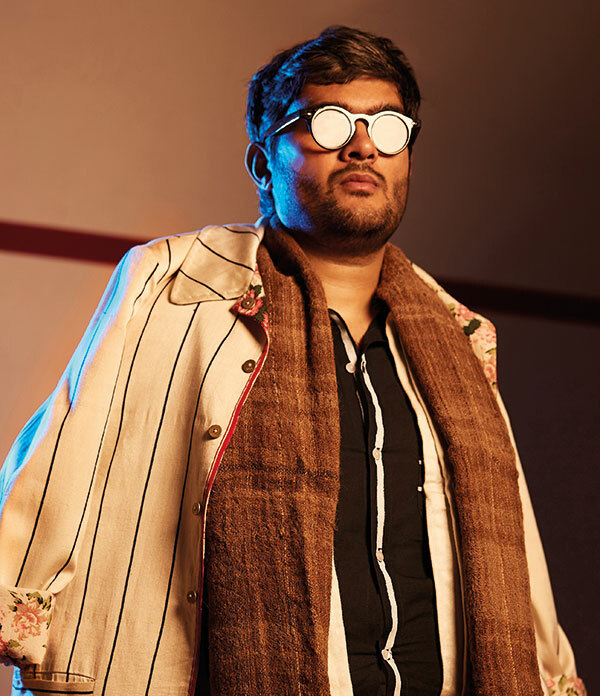 Closer to home, Mumbai-based creative arts manager and consultant Abhinit Khanna is building a bridge between the spheres of art and technology one audacious meme at a time. 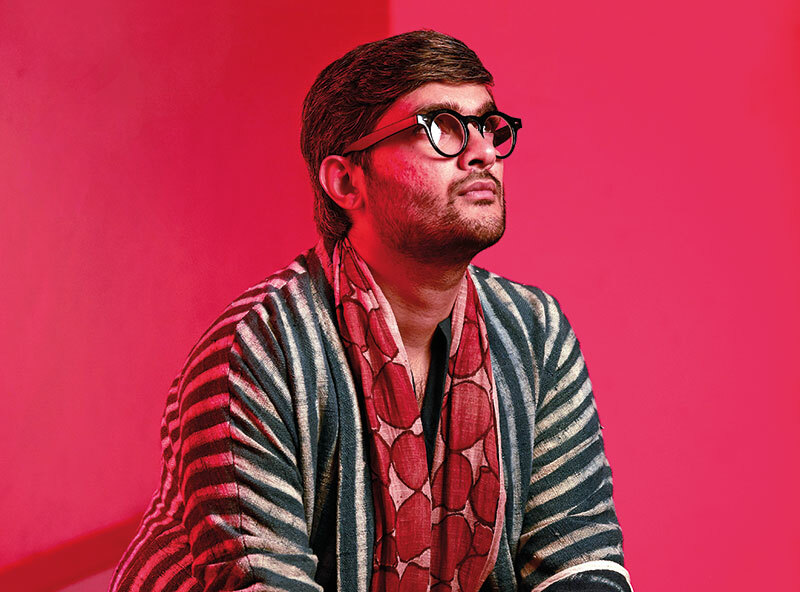 The 30-year-old Rochester Institute of Technology graduate has worked as a production assistant with some of the country’s biggest names and galleries in art and design — including Jitish Kallat and Rajeev Sethi (he worked with the latter on Mumbai’s Chhatrapati Shivaji International Airport’s public art displays) — and has been privy to the field’s good, bad and ugly. The term meme was originally coined in 1976 by biologist Richard Dawkins to describe how an idea spreads from person-to-person in a culture by random means of imitation. However, over time, the internet has appropriated it for any form of conceptual media (usually humorous in nature) consisting of culturally relevant visuals and text which get repeatedly passed on over the platform. After stumbling upon them on another Instagram page, Khanna began to use vintage pictures of Bollywood stars from the ’80s and ’90s — now almost comical thanks to their dated outfits and melodramatic expressions — adding cheeky captions that take wry digs at the art ‘scene.’ And as memes are wont to do, these spread quickly among his digital network via his Facebook and Instagram (@abhinit_khanna) profiles. Bandhani scarf, from 11.11 / eleven eleven, New Delhi. Oversized cotton tunic, from Runaway Bicycle at www.runawaybicycle.in Jacket with bell sleeves, stylist’s own. I personally related to one of Khanna’s memes when I attended one of Mumbai’s Thursday Art Nights — when galleries in South Mumbai stay open beyond their usual hours. While trays of bubbly were making the rounds, an image of the late Sridevi, seductively holding a wine bottle and a dazzling Rekha, carrying one the size of a mini-missile circulated virtually. The caption read ‘Gallerists be like — are you coming?’ With the hashtag #WaitingForArtLovers. I enjoyed his satirical depiction of Mumbai’s art connoisseurs, who were shown as being easily baited with liquor for an evening of inebriated hobnobbing rather than an appreciation of the arts. Khanna’s sharp-witted use of this viral form of communication is innovative and accessible, and the fact the he does not hide behind a fake identity lends credibility to his message. There are many instances when he examines the dynamics between the artists, gallerists, buyers, and dealers, and calls out “the handful of those in power” to help make the art world more democratic. Reversible striped and floral mashru jacket, from Péro, New Delhi. Striped shirt, from Cord, Mumbai. Khadi shawl, Abhinit’s own. 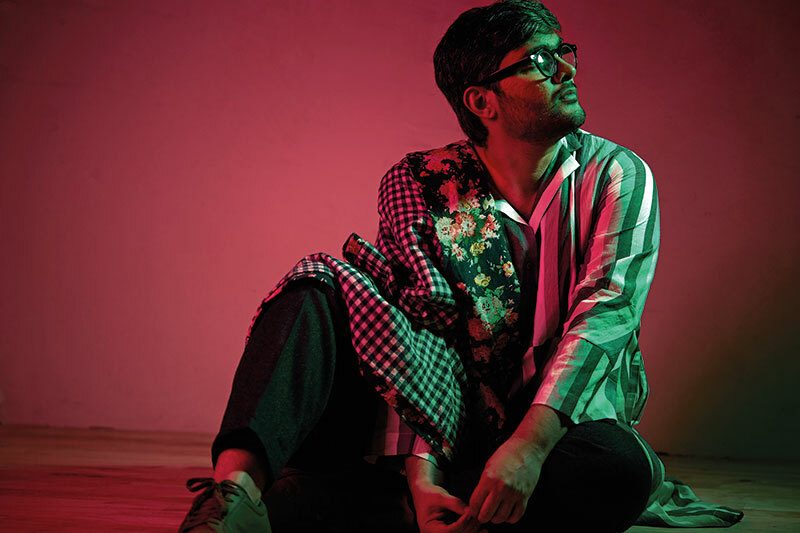 With the objective to promote India’s craftspersons, Khanna would, at one point, wear shawls as the only accessory, because he felt this was his way of “branding himself” in the art sphere. He recounts incidents during the early editions of the music festival NH7, when he would wear long white chikan kurtas with a shawl, as if he were just walking out of a gallery. He comments, “I choose to wear clothes which automatically tell people which industry I work for.” At the same time, he believes that “just because one’s an artist doesn’t mean that one has to be literal or ethnic in one’s style. What’s important is being authentic and knowledgeable about what one chooses to wear”. Why Khanna is so entrenched in the idea of crafts revival is because “these are what our roots are. This is why I have a deep love for the villages of India. It’s important to know the geography of one’s fashion; where it’s being made and who’s making it”. Similarly, Khanna had once taken British students — as part of a British Council arts project — to Delhi’s famed Toilet Museum. Towards its end, as a token of appreciation, Khanna was surprised to be given a beautiful golden khadi silk scarf. “I wore it extensively for the next four or five years. People would always ask me where I got it from,” he reminisces. Floral-printed jacket, from Péro, New Delhi. Khadi cotton dress, from Runaway Bicycle at www.runawaybicycle.in Trousers, Abhinit’s own.